i've been in the mood..
for romantic love stories and crafting. For the past couple of weeks, ever since i got my wisdom teeth out actually, i have wanted to watch one of my all time favorites: Gone with the Wind. I have looked for it and never found it, until i went to blockbuster last night and there it was! I rented Gone with the Wind & When Harry met Sally. Then I bought Becoming Jane & Pretty Woman & The Notebook. Always good to have a few of your favorites on hand. Now, if only I had My Fair Lady, A lot like Love & Pride and Prejudice... then i could sit in front of my t.v. and craft for as long as i pleased because i would never run out of movies! Last night I watched When Harry Met Sally, and hopefully today I'll watch Gone With The Wind. 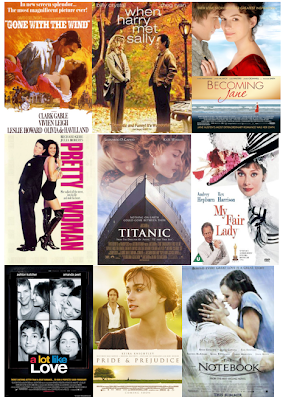 There is something with romantic movies that can make me happy even when the ending is sad. I always wish I wanted to watch Gone With the Wind. I love it, but the thought of watching it for 4 hours is overwhelming.